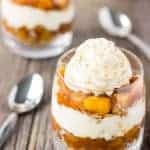 No-Bake Apple Pie Parfaits, very much like the real apple pie dessert yet this recipe is no-bake and served in a cup. Not too heavy and full of flavour! In a medium saucepan - combine the diced apples, coconut sugar, cinnamon, nutmeg, 1/2 cup water (*Warning* NOT the whole 1 cup of water!) and the topioca flour. Cover and cook for about 8-10 minutes over medium heat, stirring every minute. Mix the topioca flour with the remaining 1/2 cup water and gradually combine with the apple mixture, constantly stirring, for about 1-2 minutes, or until the preparation has thickened. Set aside and let cool for at least an hour. Combine the almond meal, rolled oats, coconut sugar, chopped pecans, grass-fed butter, cinnamon in a large bowl and mix thoroughly with your hands. Combine the heavy cream, maple syrup and vanilla extract in a large, cold bowl. Beat on high speed for about 1 minute. Make sure the apple filling isn't hot anymore. Start by pressing about 1/3 of an inch of crumb in each glass, then layer about the same amount of apple filling then whipped cream on top of each other. Repeat those steps one more time.